India’s Sagar Mala (garland around the sea) port modernisation project includes a proposed transshipment port on the southern coast of India expected to directly compete with the Colombo harbour, and in order to secure its position as a regional shipping hub, Sri Lanka should take strategic steps such as developing economic zones and introducing low tariffs while consolidating its economic ties with China, an international transshipment expert said on Tuesday. 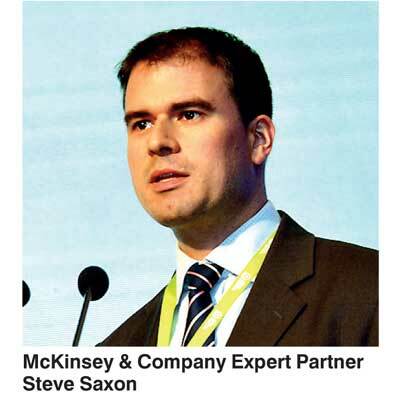 Speaking at the International Trade and Logistics session of the Sri Lanka Economic Summit 2016, Expert Partner at McKinsey & Company Steve Saxon said to prevent India from taking opportunities away, Sri Lanka should develop a long term strategy that includes expanding the Colombo port, perhaps even shifting parts of it out of the central business district. Colombo should also consider opening more free trade agreements, he added. “It’s a series of port investments planned to dramatically increase India’s export and import and also transshipment. There are actually two projects in the pipeline: One in Kerala and one in Tamil Nadu. Both of these are substantial sized ports and are designed for transshipment,” explained Saxon. The risk imposed by these proposed ports is that larger vessels could opt to bypass Colombo as a result. However, Saxon reassured, there are many ifs and buts involved. “Cochin became a white elephant because of poor planning. India needs to relax some of its laws. Each port would cost $ 5 billion in construction and involve moving local fishing communities,” he said. There will also be local-level scrutiny and a host of other issues delaying the project, he added. “If these ports come up, it’s likely that it’ll take at least 10 years before substantial capacity comes online. What should Colombo do in the meantime?” said Saxon. Sri Lanka should build up its import and particularly its exports. “Having substantial traffic is key to keep these big ships coming. Imports are likely to grow due to rise in GDP. Exports though need focus and development,” said Saxon. Special economic zones and FTAs are needed and Colombo ought to look toward China both in terms of support for investment as well as attracting manufacturers. “Invest in port efficiency. Colombo is currently doing well in terms of port efficiency, but note that the Indian ports once developed could easily surpass it,” warned Saxon. Sri Lanka must continue to develop its public private partnerships (PPPs) in private terminals, etc., in order to stay relevant. In long term port strategy, while parts of the Colombo Port are world class, there is room for improvement in some segments, said Saxon. For example, Colombo can no longer accept the world’s largest ships; it sits tight in the middle of an ever expanding city which and is in need of more land, he said. “Part of this can be resolved by Colombo South expansion. Countries like Singapore have taken the bold step to take the port out of the city, away from the central business district,” he said. “You’ve got a great position and really stand to benefit from both your own economic growth and that of India as well. The transshipment volumes coming through here make it cheaper for your importers and exporters. You must use this to your advantage. Failure to do so will lead to shipping lines shifting their direct course to the upcoming ports in India,” reiterated Saxon. Efficient trade agreements and low tarries are a must to build the country’s position as a regional hub, he said. “Cultivate China as a source of investment, strengthen local manufacturing and exports. The threat is real,” he added.